Hello everyone, happy new year! (I know we're already on the second half of January, but it's the first time I get in touch this year, so it still seems appropriate). I'm now back in London after what was a rollercoaster of a month in Lisbon and as I take a break from preparing to my next project (more on that soon), I thought I'd take a few minutes to share a bit about the experience of working in this tiny gem of an opera by Maurice Ravel. We arrived in Lisbon for rehearsals expecting to be reviving an existing production from the Lyon's Opera House, but some last minute issues meant that we had instead to come up with a brand new production on a rehearsal schedule made for a revival! Usually for a new production we're looking at 3 weeks of rehearsals, and instead we made the whole thing happen in 10 days! Again, this is one of those things that's only possible when you have a group of people on stage and off that really stick together and sink their teeth into the task at hand and, fortunately, that was the case. It was great to come back to this theatre and spend 2 weeks working with some friends from University back in Portugal who I never got the chance to be on stage with. Knowing the people you're working with and having a good relationship with them is really important when you're putting a show together on such a tight deadline. However, like some of you might already know from my Facebook artist page, I got injured during rehearsal! There is a battle scene in the end of the opera and we were using chairs for that. Everything went well except during our first stage and orchestra where I got hit by a chair in my right eye and had to be taken to the hospital. The production team at São Carlos was amazing and 5 minutes after it all happened I was on my way to be examined and, luckily, nothing serious happened. I had a cut in my right eyelid and had to get it stitched up, but my eye is fine and there's just a very tiny scar. Of course, with this happening 2 days before the premiere, I found myself suddenly promoted to a Wotan look alike, with a big amount of wound dressing in my right eye that prevented me from opening it, so for the first 3 shows, I was seeing in 'mono', so to speak. No one likes to perform under less than optimal conditions, but we were so near the opening night that cancelling wasn't really an option and besides, my voice was fine. Or so I thought! Two days after the injury, the entire cast came down with the most horrible flu! There was coughing aplenty, sneezing aplenty, fevers, body aches, you name it. After the opening night I went home and suddenly started getting shivers, body aches and just thought 'Oh, great! Now I'm being demoted to a coughing Wotan...'. Suffice to say that the morning after I felt absolutely dreadful but luckily, the virus didn't impact my larynx too much, so with very careful warming up and going into 'technically ultra supervised mode', I managed to sing through the next 2 shows. After that I had some days off which were sorely needed and when I went back for the next round of shows, I was already on the mend (and in the meantime, stitches out and seeing 'in Stereo'). 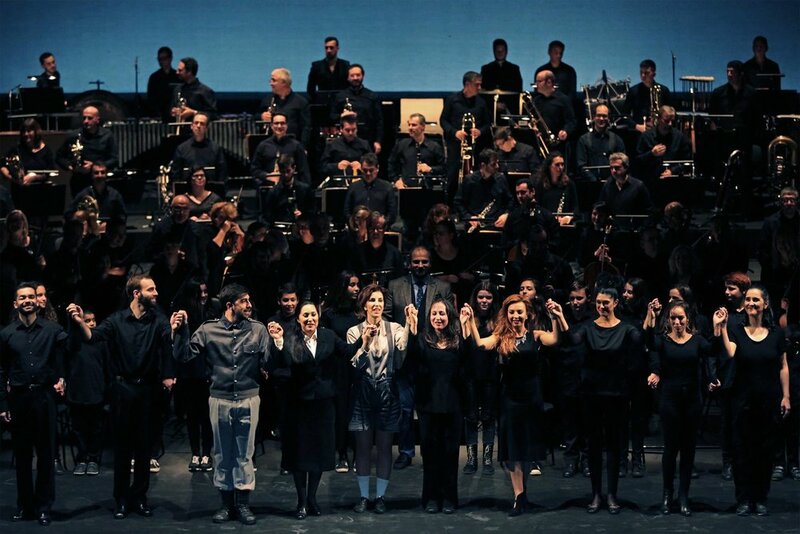 Despite all this, I did have good time with my colleagues on stage and it was great working again with Maestro João Paulo Santos who conducted Carmélites and did the coaching and music preparation for this one. It was also a pleasure to work for the first time with renowned Portuguese conductor Joana Carneiro who is an absolute joy to work with, but the final kudos must go to our INCREDIBLE director James Bonas who, in a stroke of genius, conceived a brand new show out of thin air and really got the best out of everyone involved in the production. In the end, a cast that gets ill together, sticks together and we all very much supported each other through our collective lurgy and, more importantly, everyone was such a professional that we pulled through and gave the audience a show which was very well received every night with the cast being called to bow 3 and 4 times. As for what's next, I'm now preparing the role of Lescaut in Massenet's Manon which I will be performing for the first time in Spain (double debut: role and country) this March, but given that Manon is one of my top 3 favourite french operas, it must be the subject of a separate post. In the meantime, I'll leave you with some very nice production photos from L'enfant et les Sortilèges.